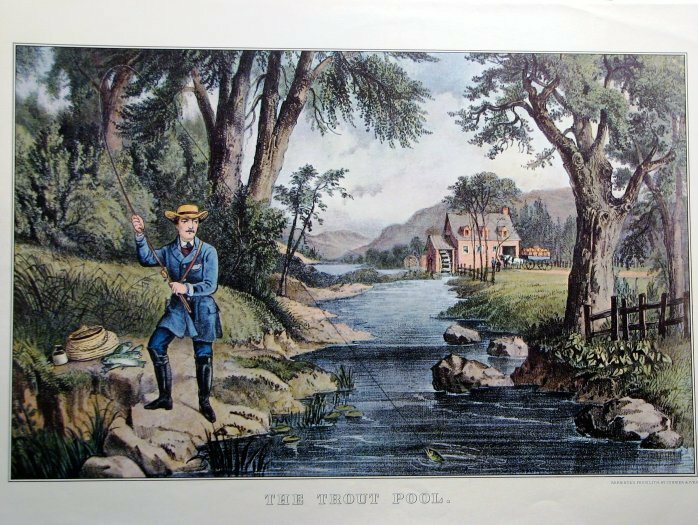 "The Trout Pool," as envisioned by the popular illustrators Currier & Ives in 1856. The angler's spiffy attire suggests wealth that is matched by the fish next to his creel. Whether or not he owns the mill depicted upstream, he is a man of leisure. In contrast to this idealized tableau, by the 1860s Seth Green and other angler-conservationists were decrying the effects of overfishing and mill wastes (dumped into streams) upon native trout populations. His idea was for farmers to recognize the economic incentives of pisciculture, thereby restocking waterways. To the charms of the meadow brook. By the second half of the 19th century, this sort of nostalgia for natural landscapes had become common in America, angling just one of many idealized pastimes. What is less expected, perhaps, is Waring’s premise that a trout brook might exist nearby to us and in harmony with domestic agriculture. In our age of industrial farming (with its pesticides, petrochemical fertilizers, and topsoil erosion) the unspoken assumption is that a healthy aquasystem would be far away in some protected wilderness—especially if you wanted to eat the fish you caught. This is what makes Seth Green’s Home Fishing and Home Waters (1888) such an interesting book. Published in the last year of his life, much of it reiterates piscicultural methods already described in Trout Culture (1870) and Fish Hatching and Fish Catching (1877). Its more radical ideas grow out of Green’s premise that “agriculture and fish culture should go hand in hand,” which he calls “the cultivation of fish” (24). Both practices entail human intervention into the natural “waste” of seeds by creating conditions for a higher germination rate, along with a reliable supply of water, nutrients, and shelter from predators. He warns farmers not to overfish populations of breeding age—just as they protect laying hens—and to conserve spawning habitat in creeks: “A great many trout streams have been ruined by cutting away the trees from the head waters” and therefore rendering the water too warm in summer months for successful hatching (36). Green’s vision of inhabitants angling for a balanced range of local fish, supplemented by aquaculture on farms, acknowledged the human impact upon ecosystems but sought to manage the consequences. In some ways it resembles Paul Greenberg’s recent proposals for harvesting seafood in a sustainable manner: “Eat American seafood. A much greater variety than we currently do. Mostly farmed filter feeders.” When it comes to America’s inland waters much less has been done. Although people continue to fish (and eat) from these polluted streams and rivers, they cannot be remediated without creating a sustainable system of farms. —Greenberg, Paul. “Three Simple Rules for Eating Seafood.” New York Times 13 June 2015. —Waring, Carl. “The Trout Brook.” Forest and Stream 8.15 (17 May 1877): 221.